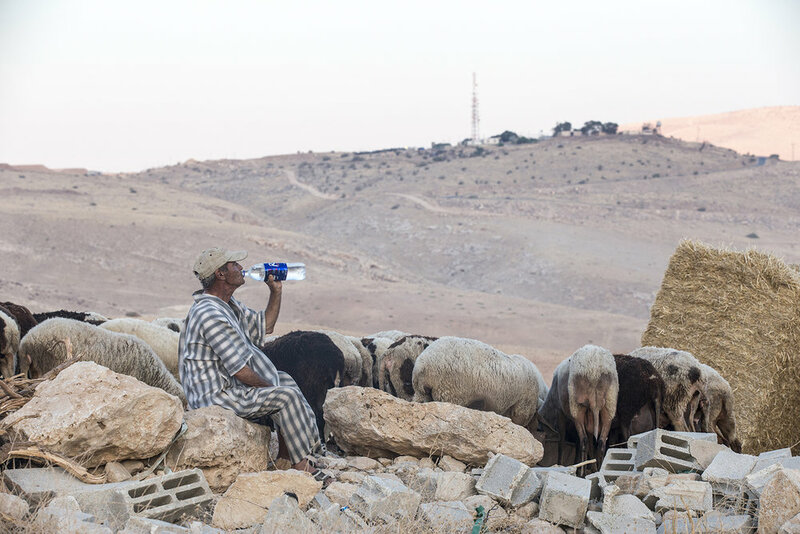 The Palestinian shepherd Hail Mahmoud Bsharat lives with his wife, children and grandchildren on a hill in the Jordan Valley, overlooking an Israeli checkpoint in the east and an Israeli army post in the west. The land they live on is their land and it has been theirs for generations. But this is also Area C: Israel retains control of security and land-management. Every day is a battle to survive for the family. House searches by Israeli soldiers are frequent and come unannounced, disrupting everyday life. And like thousands of other Palestinians in the occupied West Bank, they are deprived of a basic need - access to clean water - affecting their agriculture production and livestock. Being Palestinian, Mahmoud is also not allowed to extend his house or build a new house on his own land. He tried twice. Both times bulldozers came to demolish it. Despite the hardship and several offers to sell, Mahmoud refuses to leave: "Never! This is where I will die!" he says determined.